LYOTO MACHIDA: BRAZILIAN SAMURAI. Interview By Roberto Sant' Anna. THE 'KATO' TEST. By Bernie Heerey. TRAINING DRILLS FOR KUMITE (Part 3). By Bryce I. Fleming. THE MYSTERIES OF KI-AI. By Kousaku Yokota. KARATE AND GRAPPLING. By Matt Price. DEVELOPING FEELING. By Brian Gonsalves. OTOMO: AN ALTERNATIVE TO SEMPAI-KOHAI. By Mike Clarke. About two years ago when I was visiting SKM's accountant, my friend Barry who I've known for many, many years, who is a massive fan of UFC and MMA, he was raving to me about a new kid on the block in UFC who was causing quite a stir by beating all the top fighters put before him in fine fashion and was an un-defeated Champion with a dynamic fighting style. But the main thing he couldn't wait to tell me was that this guy was different from the rest of the UFC, MMA fighters who mostly come from a Boxing, K1, Muay Thai, Grappling or a Brazilian Ju Jitsu background, this guy was from SHOTOKAN KARATE! 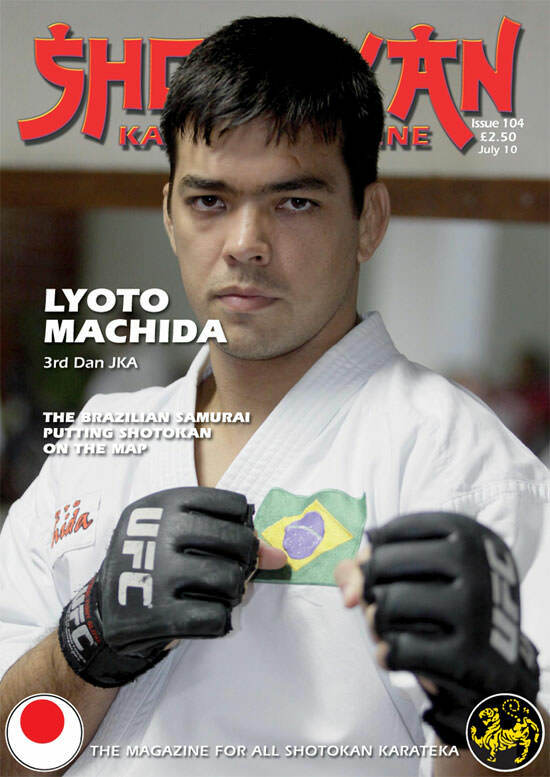 And apparently he (Lyoto Machida) was very proud to say that his main training and pedigree was, and still is, Shotokan karate-do and he's been training since the age of four in Brazil with his father and brothers and still does to this day. Well, I have to ask in all honesty, how many times can we (Shotokan) say that someone puts us on the World map via worldwide television coverage or any other media for that matter? Not too often, if ever, is the answer, Yes? However, in this edition, here is one young Shotokan karateka from a truly traditional karate training background (his father is JKA Chief Instructor in Brazil) who has done just that. Anyone who has watched or who has the slightest bit of interest in MMA or UFC will know the name of Lyoto Machida, a fantastic Brazilian fighter and competitor who only very recently (May 8th) lost his first fight to fellow Brazilian Mauricio Shogun Rua in Montreal. The one thing you may not know is that Lyoto is a Shotokan karateka right down the line, through and through and still practices our style, even though he now makes his living as a professional UFC fighter. 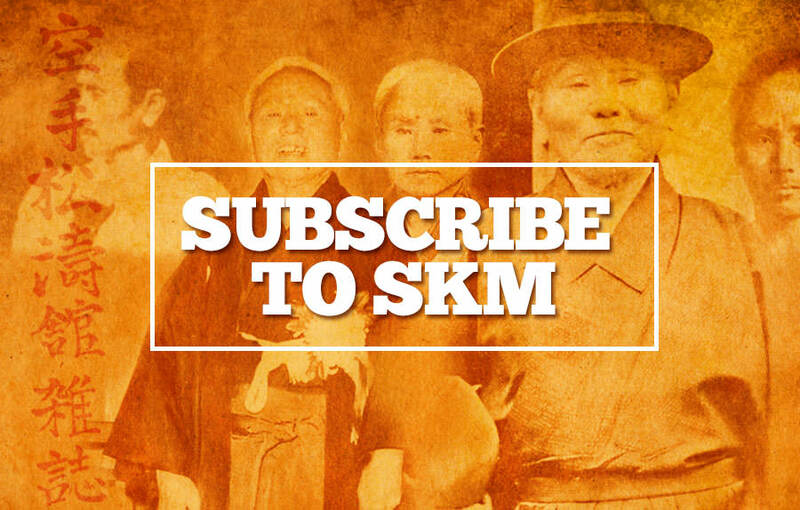 I have to thank my good friend in Brazil, Roberto Sant' Anna for his painstaking work and effort in arranging and conducting this exclusive interview for SKM with the former UFC World Light-Heavyweight Champion. And I feel that it is a superb, although quite different type of interview for SKM. The reason that I have happily used this interview in SKM is because here we have a young, truly gifted karateka who has paid his dues in traditional karate-do and who obviously respects the tradition through his father and his training, but has moved on to try his hand in another world, namely professional fighting, which is no easy task! You only have to read what he says and you will see, that he is one of us, he's SHOTOKAN! We traditional karateka have to be careful sometimes when criticising things like MMA and UFC because these guys work and train incredibly hard, just like professional boxers. In April this year the JKA (Japan Karate Association) appointed a new Chief Instructor, the very popular Ueki sensei, with senseis Tanaka and Osaka as his assistants. Author, Brian Gonsalves based Massachusetts. While working out in the school gymnasium a fellow faculty member asked me for some advice regarding exercises he could perform to improve the condition of his back. He was recently in a car accident and desired some rehabilitation. He also would like to tone himself up a bit, and trim down consequently expanding his physical capabilities. Another person, third party, working out at that time offered unsolicited advice. Her advice was valid and sound, but it was not what he was seeking. Though we are both professional educators, she is academically more qualified to provide information on this topic, older than I am with more teaching experience, and has a physical education background. He took her advice politely, thanked her for her time and opinion. I continued working out, waited for her to finish her lecture on exercise and the body, examining his demeanor. While listening, he consistently referenced me with quick glances demonstrating subtlety; his question was not being answered. Later I took him aside and demonstrated a few simple exercises and how they could be executed effectively. They were not different or special, many of the exercises were exactly what she had previously mentioned yet somehow, to my friend, contained more meaning. I explained how to do the exercises, went through the steps, proper form, but also how they should be felt. I discussed the proper interaction his body should have with the different movements, taking time to be aware of the muscles expanding, contracting, and breathing involved. Without this internalizing and experience it is particularly difficult to achieve any results especially with visibly indirect muscle groups like the back. The movements should become part of you, mentally recording as much about the experience as achievable. Without this internalizing, feeling, envisioning the particular muscles you are working, results will be limited. He seemed to appreciate my honesty, depth of understanding the questions presented, and passion resulting from personal experience. I suppose he felt these qualities were just as important as the academic answer provided to his question. Our discussion involved aspects of the training procedure and the physical results which should be expected. During the process of training, the muscles will become sore and direct your attention to them. You will grow to be mindful of the individual muscles and their functions, feeling them move and how they help your body perform. This self realization is a gift most people never have the opportunity to acknowledge or appreciate. Our bodies can become an asset helping us to understand ourselves and interact with each other through this knowledge. This person accepted my explanation and opinions more readily than that of the others even though they were similar. He was looking to me, I speculated because I teach by example, believing in the things I do. Similar to many of you reading this article presently, training is a way of life for me, weight resistance, karate, cardio, etc. I train daily in the gym, dojo, an empty classroom, home, wherever or whenever I get a chance. This love of training is something I can offer that the other faculty member might not be able to. Although she is involved in the fitness field she does not share the same obsession. I understand the sacrifice of training and that most people would not be willing to make the daily commitment I so eagerly do. I understand my search for knowledge and self improvement, internalizing ideas and probing for meaning changes a person within, as well as the external appearance. There have been many instances while teaching class I have asked students to feel the stance, basic, form, etc, but how is this sensation developed? They are being asked to consciously develop connections between the mind and body which for some proves to be an intricate undertaking. The continual practice of technique may help in its development but without being mindful of your body and the muscle groups involved in each movement the desired result may not be reached. Time, age, enjoyment, and experience seem to be partners in the maturity of sensation and developing the connection between mind and body, along with making each move with awareness linking your body from the ground up. These connections must be made by the individual practitioner, demonstrations can be prepared and lectures given but until the student makes their individual epiphany, progress is not made. The students witness your teaching through their individual perspective which may or may not be ready to process and digest the information provided. While some students have the ability connecting the mind and body almost instinctively, most I have found, do not, leaving the road for them different and more complex. Their journey to make these connections may or may not ever happen. These students may hear the lesson but do not have the capability to differentiate their techniques and abilities from the examples being set. Simply stated the students who do not apply what you are teaching are lacking the skills to achieve the desired result and also lack the ability to recognize they are not achieving the desired result. These students may truly believe they are following the example set and doing exactly what is expected. Unfortunately for these students, they may train for long periods of time before realizing the goals set by the instructor are not being reached and their development has been impeded. When a martial artist moves and demonstrates technique appropriately their performance fits their body type, is effective and relaxed but still remains threatening. This foreboding presence permeates their forms. Although everyone is not exactly the same the goal is to reach a set standard, alter the practitioner. When this ideal is accepted by the student, he or she consistently tries to adhere to the standard, and is conscious of personal movements, the student begins to feel what good technique is, so they can repeat and practice. Each technique must be attempted, reflected upon, revisited, and discussed with seniors and peers making karate part of the student and the student part of it. Visually you can see the difference between a person who feels a form and one who simply has good technique. A sequence of events linked together forming their version of the kata does not demonstrate good forms, understanding of the form or themselves. Even though each technique individually may be performed well the kata may appear choppy and robotic. The kata does not tell a story or have a quiet threatening atmosphere to it. I encourage students to consider their body parts: hands, feet, etc, when learning karate so that this concept becomes innate. They are taught not just techniques but how to use their body to its fullest potential at the present time. Their depth of understanding should be increasing with the passing of time along with the potential of their body. The concepts are probably a little beyond their level of comprehension at the beginning stages, but my martial art, the one I attempt to share with others is about individuals learning and developing themselves so that they can improve their lives outside the dojo along with the immediate goal of the training sessions. Hopefully my students will develop themselves to the point where they do not "need" me but still enjoy the guidance and perspective I provide. I simply offer an opinion and encourage them to draw their individual conclusions. With maturity comes a depth of appreciation and feeling, I try to expose students to these ideas providing thoughts they could consider in the future expanding their personal understanding. During class I attempt to present a learning environment conducive to my ideology and strive to offer students appropriate learning opportunities. Each student presents individual challenges for their instructor as the instructor presents challenges for them. Teachers should acknowledge students as individuals with different contributing talents and requirements while striving to meet the set standard. Today's students will inevitably become tomorrow's teachers. As an instructor I have an enormous responsibility to prepare all of my students for the next step, give them as much as I can, believe in them, and help them believe in themselves while assisting them in the creation of feeling within their art in the hopes they transfer these lessons into other aspects of life. Unfortunately there is no set formula for teaching because every student will be different and each relationship unique. Each time I decide to stand before other people considering myself their teacher I remind myself to believe in what I teach, practice what I preach, and lead by example, continuing to refine myself both in front of my students and when they are not in my presence. It has been almost three quarters of a year since I shared opinions and ideas with my friend in the weight room. I have watched him slim down and become more conscious of his eating habits and its effect on the body. We have engaged in many other conversations involving diet, exercise, food, work, family, philosophy, etc. He has thanked me several times, informing me he appreciates my passion when I speak. He has internalized the ideas offered and used them efficiently within his life. The thought that I was part of the process or aided in his development provides a great amount of satisfaction. I believe he has developed an individual passion for fitness which will help him to lead a more productive life.